University of Delaware Clinton Global Initiative U participants and student liaison Meng Fan. 2:56 p.m., March 6, 2015--This weekend, 15 students from the University of Delaware will join almost 1,000 of their peers in Coral Gables, Florida, for the annual meeting of the Clinton Global Initiative University (CGI U). UD students represent a variety of academic disciplines and commitments, including an Engineers Without Borders Project in Malawi, UD H-2 Grow and JUMPStart, an organization that connects the homeless or near homeless with university students who review their resumes. 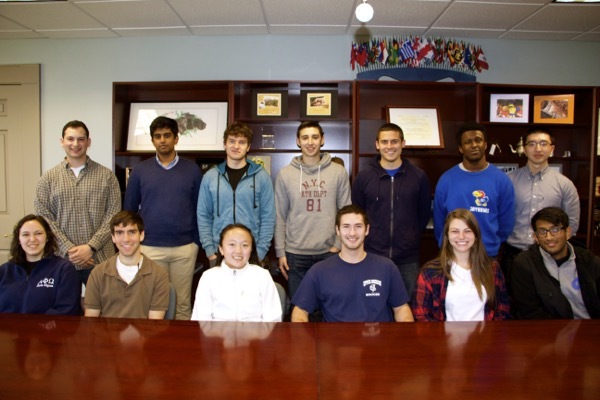 Students representing UD include Timothy D’Agostinio, Dylan Buller, Heather Brody, Dominique Oppenheimer, Emily Zhang, Jaewoong Yoo, Garrison Davis, Arvind Annamalai, Dakota Hanemann-Rawlings, Kyle Lusignea, Taylor Boyle, Bimal Amin, Thomas McDowell, Matt Rojas and Matt Sobel. Although all share pride in being selected to participate in CGI U, the students’ conference expectations vary as greatly as their projects. Zhang is hoping to network and make connections. Her organization, FEMPower, is a health education program focused on tackling the outdated cultural beliefs that often lead to unplanned pregnancies and poor health conditions for Haitian women. To follow UD’s 2015 CGI U participants during the conference, visit @UDGlobal on Instagram and Twitter. For more information on the Clinton Global Initiative University, contact student liaison Meng Fan at mengfan@udel.edu. Founded by Bill and Chelsea Clinton in 2007, CGI U is a program aimed at empowering students from university campuses across the world who are at the forefront of addressing some of the most pressing global challenges. CGI U requires that participants take on a Commitment to Action, an innovative solution to a challenge within one the five CGI U focus areas.